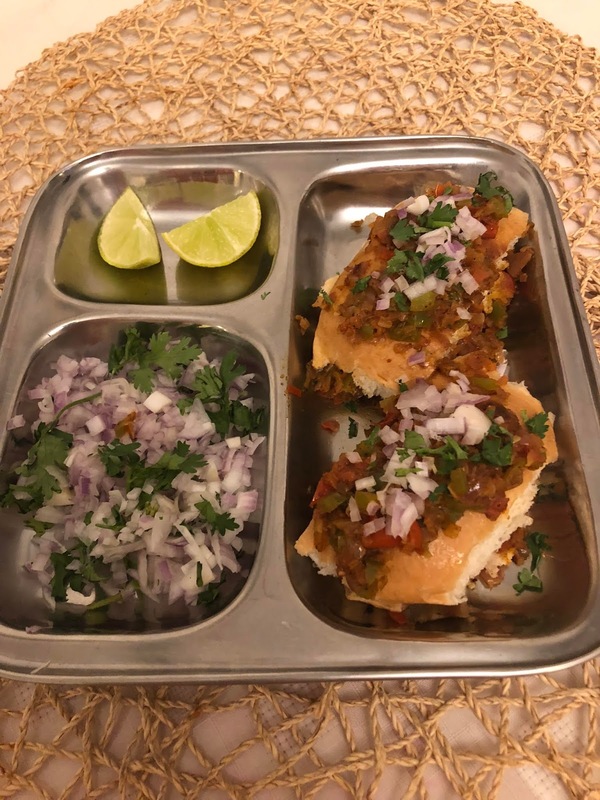 Masala Pav is a popular street food in Pune -the masala consists of finely chopped onions, tomatoes & capsicum with a generous amount of butter mixed with pav bhaji masala! I guess Masala Pav is an underrated street food as there are more takers for pav bhaji & wada pav. Cook the capsicum in a cooker. In a large, wide pan add generous amount of butter, add ginger garlic paste, add the pav bhaji masala, give it a quick stir. add the onions, cook until they turn transparent, add the tomatoes and sauté until they are cooked. Add the capsicum, salt, lemon juice. Add more pav bhaji masala as per your liking. remove the masala and keep in a bowl. In the same wide pan, add some salted butter and, take a pav (Indian Bun) & slit in between, spread some butter on both the sides of the pav & add the masala on one side, close the pav and toast the lower side of the pav & turn it after it turns brown. Place the pav on the serving plate, add some masala on the top of the pav, and garnish it with finely chopped onions & coriander leaves & few drops of lemon juice (optional). Serve with lemon wedge & chopped onions & coriander leaves. Take 1 cup of moth beans, wash them under running water, drain the water & soak them overnight or more than 8hrs in boiling water, drain the water next day, spread the beans on a kitchen towel to dry, when the beans are dried completely add them in a maslin cloth and tie them loosely to make sprouts. This may take another 7-8 hrs. Once the sprouts appear, add them to a vessel & pressure cook for 3 whistles. 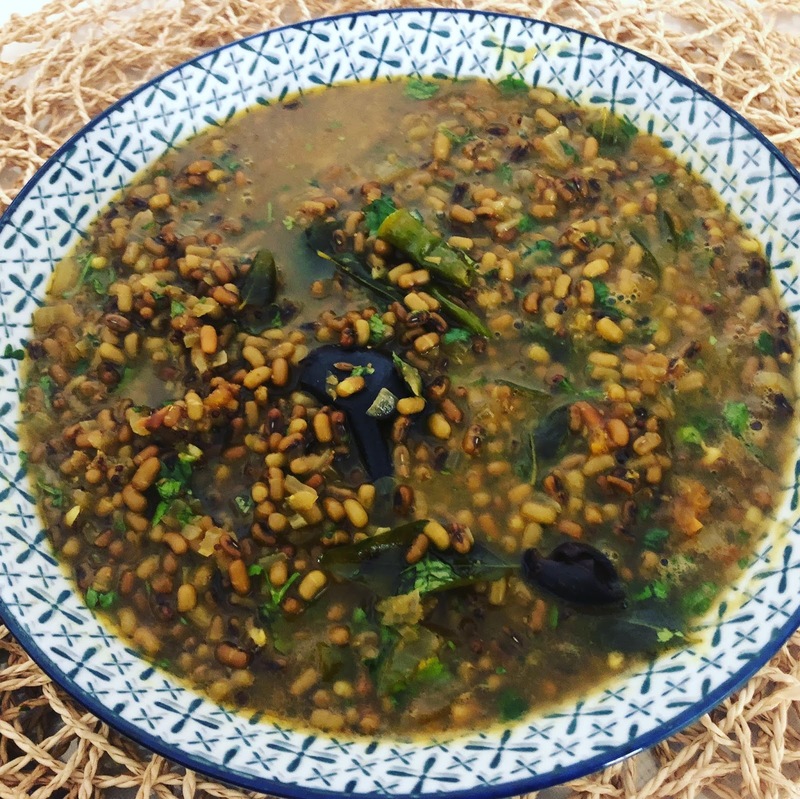 In a deep bottom pan, add oil, once the oil has heated, add mustard seeds, turmeric, hing, curry leaves & green chilies, give it a quick stir, add the finely chopped onions & fry until they turn transparent, add the tomatoes & fry them until oil is separated from the vegetables, add the cumin & coriander powder. Now add the cooked moth beans, salt, kokum, jaggery, water & bring the curry to a boil. I make the usul dry but if you wish to make it watery or semi dry add water accordingly & adjust the spices too. Lots & lots of memories are attached to this wonderful recipe. Every summers Aai used to make homemade mango ice-cream. We used to happily help her to make the mango pulp. It used to be a fun activity. I remember she used to make 2 box full of mango ice cream which we used to polish within no time. most importantly this recipe is very simple and needs only 4 ingredients to make it. This recipe is so much better than the ready-made ice-creams, it has the same soft, creamy texture and you know all the ingredients used are fresh & has no added artificial flavors. It has all the goodness of the Alphonso mangoes. 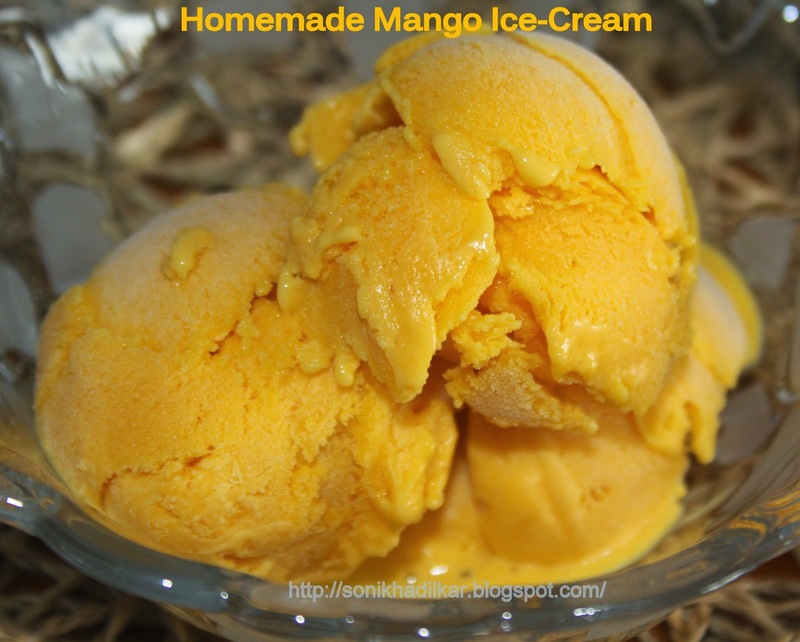 You can also enjoy the ice cream with freshly chopped mangoes or mango pulp. Here's the recipe. In a deep bottom vessel mix the sugar, milk powder to the milk and bring it to a boil. Switch off the flame after the milk starts boiling. Keep the vessel away to cool. Blend this and store it in the ice cream box. I used Tupperware box meant for making ice-creams. Leave it in the freezer for 3hrs. Remove it from the freezer after 3 hrs & blend the ice-cream. This procedure is done to avoid crystalization of the ice cream. Refreeze the ice-cream for 12-15hrs. Remember the freezer should be at maximum temperature & the ice-cream is made in air tight box. My mother used to make the ice-cream in aluminum container with a lid. 1. When you blend the ice-cream, it should be of the same consistence of that of a softy. 2. If the ice-cream is not similar to softy, please leave it in the freezer until it reaches the correct consistence. 3. If the ice-cream is too hard, leave it outside to melt for a while. In a pot add the sugar & water and make a thin syrup, after the syrup starts boiling add the mango cubes, add the saffron strands & cardamom powder, simmer on low flame, until the mango pieces are cooked. This will take 5 minutes more. 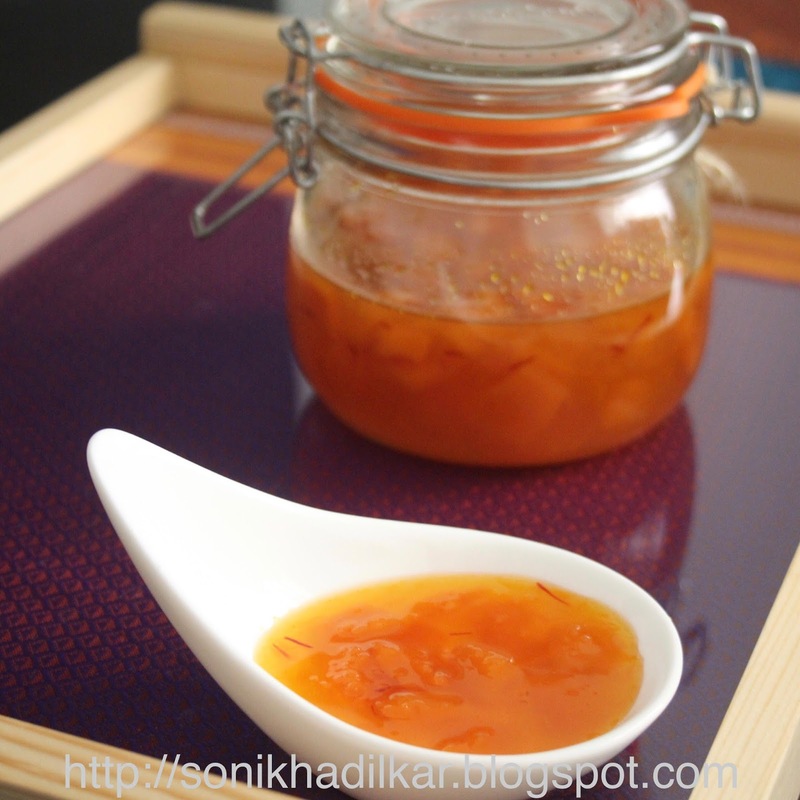 Remove from the flame & let the murambba cool, store it in a glass jar or steel box. Murambba can be stored for more than 6 months. Popsicle's are very popular these days in India, this Popsicle is made from fresh fruits, without any added sugar or water. If the strawberries are sour the natural sugar in the watermelon will take care of the it. 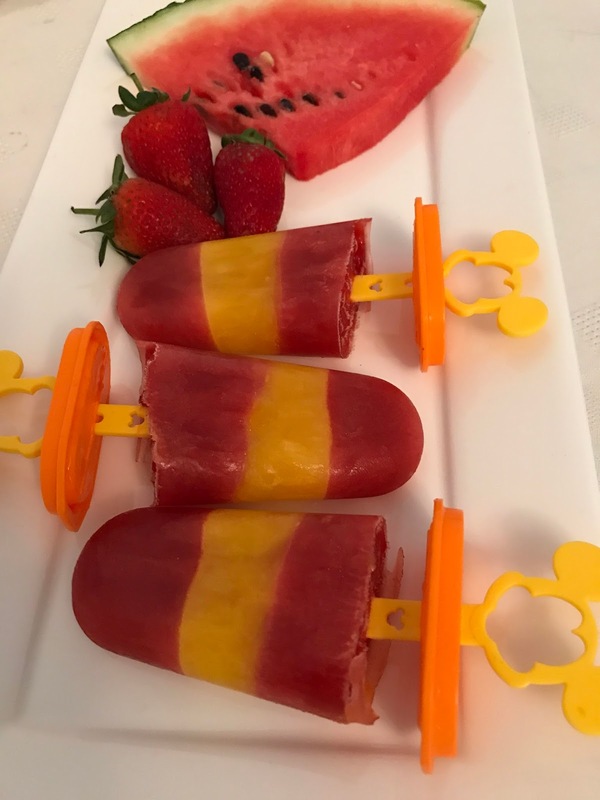 Mangoes & Watermelon are available in abundance these days, so I thought of making a Popsicle using these fruits, the end product is so appealing its a perfect treat for kids and their parents. Take a small piece of watermelon and remove seeds, use 6 ripe strawberries, chop roughly, blend both the fruits together them until you have a puree. Pour 2 or 3 tsp of the watermelon & strawberry puree into the bottom of the Popsicle mold freeze for 45 minutes. In the meanwhile use fresh alphonso mangoes to make puree, blend the puree into a smooth paste, pour 2 or 3 tsp of the mango puree on top of the strawberry & watermelon puree, freeze until set. this may take another 30-40 minutes. Remember not to use the stick of the Popsicle mold to set the mango layer. Use only the cover of the Popsicle mold. After the mango layer has set, pour the remaining watermelon & strawberry puree on the top layer of the Popsicle mold, Use the stick to cover the Popsicle mold and allow the Popsicle to set. To remove the Popsicle's from the mold, take a glass, fill it with warm water, dip the mold for 10 seconds remove the Popsicle's and enjoy.